…But at least I can give you some first impressions of the game. You will have to wait for our official reviewer to give you a more detailed assessment and the all important score. 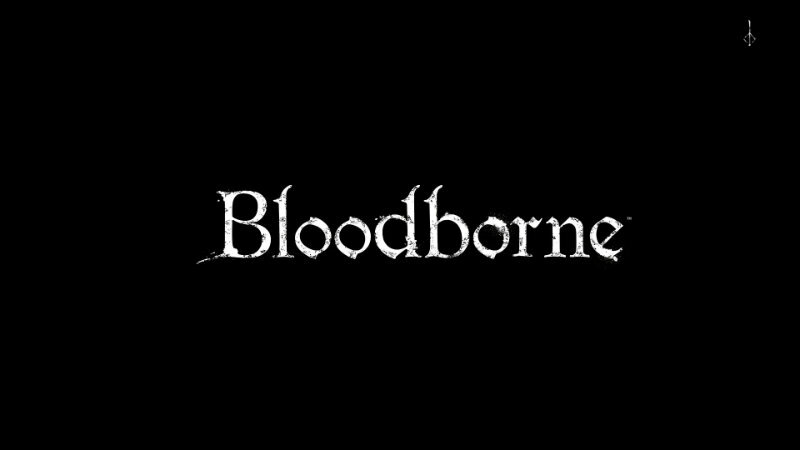 However, I engaged in bizarre couples’ bonding over the weekend by playing about 10-12 hours of Bloodborne like a normal person (not rushing) and here are some initial thoughts. Before we talk about gameplay, there is something that is even more readily apparent. 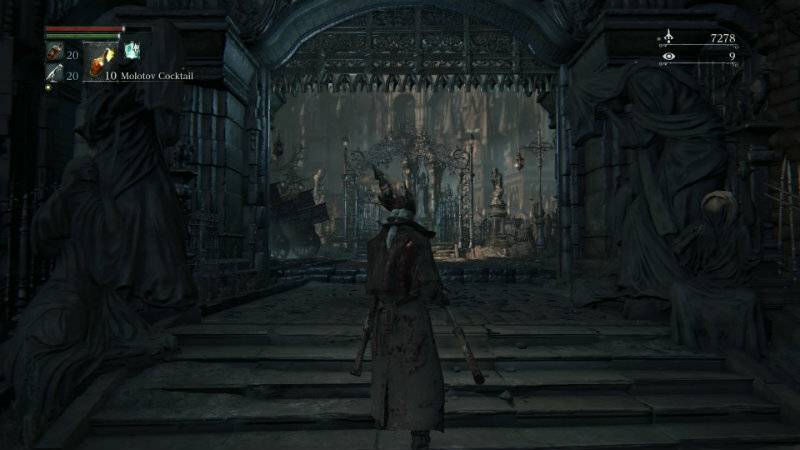 The aesthetic of Bloodborne is incredible. The Victorian style world of Yharnam is dark and terrifying, with impressive textures and absolutely gorgeous set pieces. Each character is detailed and unique, with enemies muttering strange comments at you as they kill you (or perhaps you kill them). Enemies become terrifying, not just because of how they look or how easily they can kill you, but also because of how they sound – hearing their footsteps can send a bolt of dread up your spine, but they are almost more fear inducing when you can barely hear them as they sneak up behind you. Werewolves in particular are stealthy until that snarl that means almost-certain death. 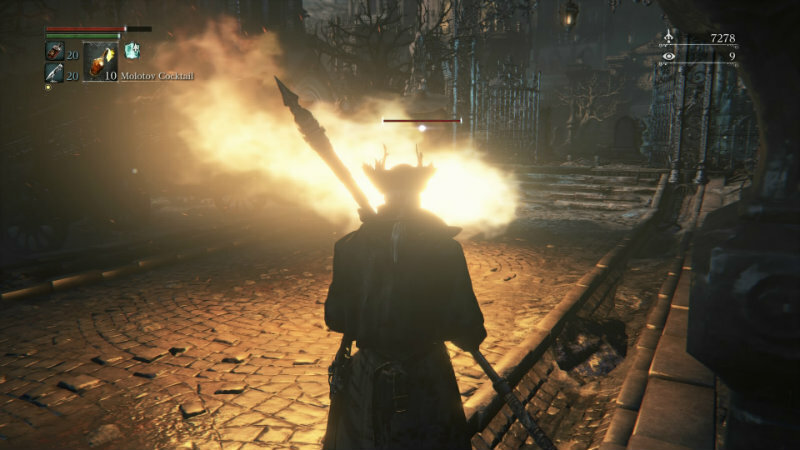 For fans of the previous Souls games, Bloodborne marks a shift in strategy. Without shields, combat is much more offensive. However, it goes beyond that. Players and enemies move much faster and you will find that you need to dodge out of the way of attacks – absorbing damage simply isn’t an option. This increases the pace of the game and makes it feel much more urgent and dynamic. Dodging out of the way of one enemy might send you off a ledge or into the attack of another enemy. It’s not just bosses with unique combat moves, either. Some enemies might be equipped with flame throwers while others wield giant axes. Like other games out of From Software, it will be necessary to take your time and learn their animations to determine the best time to strike and when to dodge out of the way. Parrying with your firearm can be particularly satisfying, although getting the timing right might take more practice (and deaths) than you’re prepared for. In fact, the controls in general are a whole new spin on things. Be prepared for accidental healing as your attempts to make your weapon a two-handed affair based on Dark Souls controls results in using up a blood vial instead. 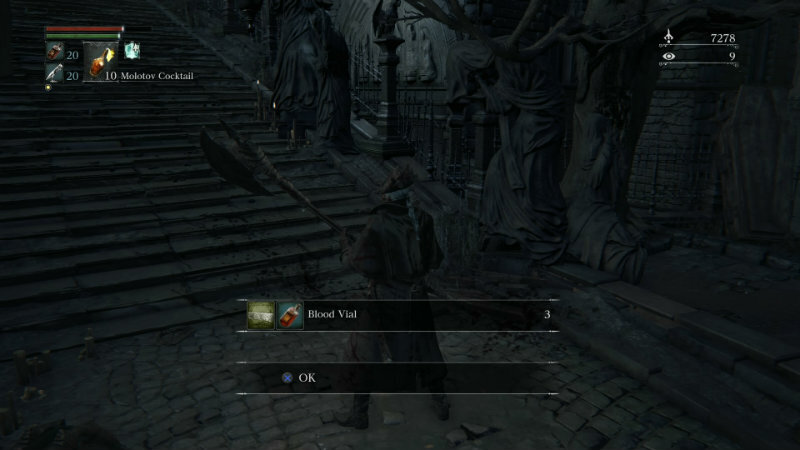 Luckily, blood vials are frequently dropped by enemies, reducing the anxiety about running out of healing items. While you can only carry a limited number of healing items and bullets, spare items are automatically sent to your storage box kept in the Hunter’s Dream. Plus, when you leave the Hunter’s Dream, blood vials and bullets are replenished to maximum from your storage – at least it saves the extra trip to your storage chest. Despite these small extra blessings, the game still feels incredibly punishing, and rewarding. Finding the rare chest truly feels like finding treasure and unlocking a shortcut back to the hub world can bring the greatest relief. Bosses are epic, plus there are often hidden elements to them that can add an extra dynamic to the experience. Once again, thorough exploration is integral to getting the most out of the game – forget to go around that corner? You might miss the door that actual leads to an extra note with lore and a route to another area. Or you might miss out on the item from the small child whose parents are missing – something quite useful for the upcoming boss battle. 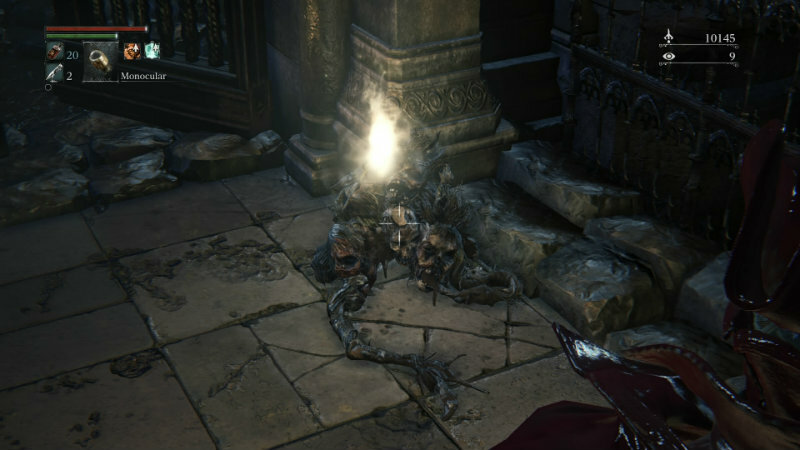 Back in Bloodborne are the beloved crystal lizards of previous Souls games. However, they aren’t lizards anymore, and they don’t sparkle or make that twinkling sound. Instead, out of the corner of your eye you might see some weird looking thing running away from you. Chase it down and you’ll be rewarded with this visual and a bunch of cool upgrade blood gems. Despite a day one patch of about 2.6GB, the loading times are still abysmally slow. Dying or fast traveling can be particularly frustrating as you wait what feels like forever (but actually maxes out at about 30 seconds) to jump back into gameplay. For a game that results in frequent death, staring at this loading screen can feel like an extra punishment. Here’s hoping it will be patched soon. It is still far too early for me to even begin to claim to have a full experience of the game. However, from the bit that I’ve tasted thus far, it is a gothic masterpiece. Excellent gameplay combined with stellar aesthetics and deep lore all make this a must own exclusive for the PS4. It isn’t just for fans of From Software, new players could also enjoy this title as long as they remember to be patient and not just run into battle. Or off ledges. Play at your own peril and be prepared for suspense and horror unlike anything I’ve experienced in any modern game. Oh, and here is an amazing video of me unboxing the media kit that we were sent.